You may be wondering whether you should you plant seeds or just go ahead and buy the pepper plants? I believe that unless you are skilled and have a green house, it makes sense to buy your pepper and basil as plants at least at first. You can find numerous varieties of both peppers and basil at your local nursery, so don't hesitate to try more than one. Since the general requirements for sweet peppers and basil are similar, plant them together. Do not, however, plant sweet peppers within 20 feet of hot peppers or your sweet peppers are likely to be more hot than sweet. When deciding where to plant, peppers and basil both need full sun. Avoid planting peppers where you planted eggplant, tomatoes, or potatoes the year before because all come from the same plant family. When buying transplants, always look for plants with strong stout stems and dark green leaves. Do not get plants that are blooming because they will not produce well. Peppers take at least two months to set out plants so if you live in a northern region, be sure to choose early maturing varieties. I prefer planting my peppers in beds and plant them eighteen inches apart. I then plant a basil plant between each of the pepper plants. Plant near okra if you live in a windy area because okra serves as a windbreak for the delicate and often heavy laden sweet pepper plants. You may also want to stake your pepper plants. Sprinkle kelp powder in the planting hole, water well. Place cardboard collars around each stem to deter cutworms and push them at least an inch into the ground. (2 inch segments of toilet paper tubes are excellent for this purpose). Plant pepper plants to the depth the plant was growing in the pot. Tamp plant into grown firmly. Water well and water daily for the next week until transplanted roots are established. Because peppers are tropical plants, they will not grow in cold temperatures. If weather turns chilly, cover young plants with hot caps. (Quart canning jars work well for this.) Remove when temperatures rise above 70 degrees. Sweet peppers, also known as bell peppers, are a garden favorite (second only to tomatoes). Basil (second only to dill) is a favorite herb. Sweet peppers and basil make great companions both in the garden and in the kitchen. Plant sweet peppers and basil plants in late spring after all danger of frost is past. You'll be able to snip off basil leaves whenever you want to add them to cooking, and once your peppers start to fruit, you'll have peppers and basil.until frost. Commonly called sweet basil, the culinary herb Ocimum basilicum of the family Lamiaceae, this plant was familiar to the ancient Greeks. Sweet Basil is used fresh in cooked recipes and should be added in the final minutes of cooking because cooking destroys the flavor. Basil is most flavorful if used fresh. Fresh basil can be kept in plastic bags in the refrigerator for a few days or in the freezer after a quick blanching in boiling water. Dried herb loses much of its flavor, therefore use basil fresh whenever possible. 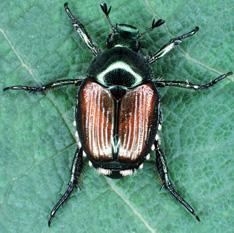 The Japanese beetle (Popillia japonica) a serious pest of about 200 species of plants including basil. Peppers like even watering, so once the soil has warmed, spread a thick, but light mulch such as straw or grass clippings around the plants. Water deeply during dry weather to encourage root development. Pull any weeds by hand. Though peppers are a tropical plant, they will wilt and drop blossoms, If this occurs add more mulch around plants. If peppers demonstrate slow growth or pale leaves, a feeding of manure tea will help. Most pests do not bother pepper plants. One exception is the pepper weevil. The worms of this insect will chew holes in blossoms and buds causing misshaped fruit. Hand pick pests and feed them to your chickens or drop in hot soapy water. Early blight is dark spots on leaves and stems, infected leaves will die. Mosaic is a swerious viral infection that mottles the leaves of young plants with splotches and eventually makes them curl and wrinkle. Any fruit produced becomes bumpy and bitter. Japanese beetles are the primary pest that affects basil. If they begin to skeletonize plant leaves. The best control is by hand picking. To harvest basil, begin picking leaves as soon as the plant is large enough to spare them. Collect from the top leaves on the branches and cutting off several inches. Handle your basil carefully. For future use, basil can be air dried in small loose hanging bundles. Once dried, remove leaves from the stems and place dried leaves into a bottle or plastic bag and store at room temperature in a dark location. They can also be packed in olive oil by mashing the leaves to make a paste. Freeze in ice-cube trays and use in sauces and soups. You can also store this concoction in the refrigerator. You can also make a pesto of pureed basil, garlic, grated cheese and olive oil. 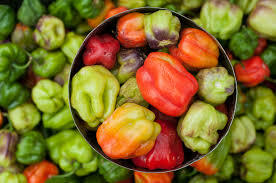 Sweet peppers become sweeter as they mature and turn from green to the mature colors of the variety of peppers grown, however, any pepper can be picked and used green. I think that planting a pepper and a basil plant in the same container would be an excellent idea. I would be that if you planted some thyme in the pot as well, because the thyme would work as a "ground cover", it would pretty as well as eatable. If most pepper plants are bug free, then I will truly enjoy planting them in my garden. I love the taste of peppers and basil in most dishes. Thanks for sharing this information. I think these two are fantastic choices for new gardeners. Thanks for the feedback, Bill. We grew them both last year without the visit from the beetle. For whatever reason it was a good season for peppers and basil...hope the same is true this year.